Prominent & Leading Manufacturer from Ahmedabad, we offer linseed oil, sesame oil and castor oil. 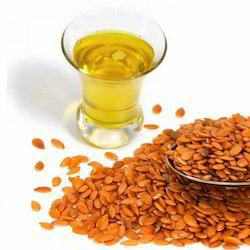 100% Linseed oil is a clear to yellowish color oil obtained from the dried ripe seeds of the flax plant and therefore commonly called flax seed oil. This oil is generally by cold pressing and solvent extraction methods. Also known as drying oil it is known for polymer-forming properties and thus can be blended with other oils, resins and solvents. The Linseed or flax plant is mainly cultivated in regions where there is alluvial soil. Canada, China, India, USA, Ethiopia are the biggest producers of linseed. Linseed Oil is one of the most useful natural oils which can be used for several purposes like varnish in wood finishing, pigment binder in oil paints, plasticizer and hardener in putty and in the manufacture of linoleum, soaps and inks. It is a slow-drying liquid with nice preservative properties and water resistance and therefore makes a good wood preservative. As in form of edible oil it contains the highest level of omega-3 fatty acids among vegetable oils and is most beneficial for reducing inflammation leading to atherosclerosis and for preventing heart disease and arrhythmia. 100% Natural sesame oil, also known as gingelly oil or til oil, is an edible vegetable oil, extracted from the seed pods of dried sesame seeds (Sesamum indicum). The colour of raw sesame oil is related to white, brown and black sesame seeds. Pure sesame oil prepared from cold pressed white sesame seeds is almost colourless and flavourless. Genuine sesame oil prepared from roasted/toasted and brown/black sesame seeds are golden or dark brown/black in colour with typical flavour. Originally from Asia and Africa, sesame is chiefly cultivated in India, China, Africa and Latin America. 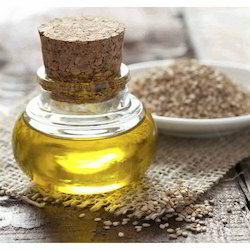 Organic sesame oil has anti-oxidant, anti-depressant, anticancer, antibacterial and anti-inflammatory properties. Authentic sesame oil is cholesterol free and widely used in cooking, worship, body massage, hair treatment, foods, drugs and cosmetics. 100% Natural castor oil, is obtained from the seeds of castor(ricinus communis) plant. Traditionally a laxative, organic castor oil is native of Ethiopia and produced in India, Brazil, West Indies, Africa, Asia, Europe and USA. Pure, refined castor oil (BP) is a brilliantly clear liquid and free from suspended matter with details like acid value(mgKOH/gm) 1.0 max, f.f.a. (as oleic) 0.50% max, iodine value(gm12/) 82-90, saponification value(mgKOH/gm) 176-187, unsaponifiable matter(%) 0.80 max w/w, hydroxyl value(mgKOH/gm) 160-168, peroxide value(miliequ/kg) 4 max, moisture(%)-0.25 max, foreign fatty substances complies with tests, relative density @20°C 0.952-0.965 gm/ml, refractive index @ 20°C-1.4770-1.4810, optical rotation, +3.5° – + 6.0°, solubility(miscible with alcohol) for 2 ml add 8ml alcohol, absorption(270 nm) – max 1.50(1% solution w/v in 96% ethanol), colour on 5.25” lovibond scale (yellow/red) Y-10.0 max, R-1.0 max. 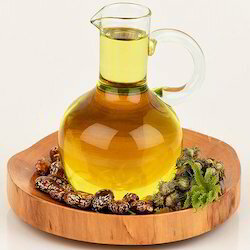 Genuine, refined castor oil (BP grade) is used in sectors such as pharmaceuticals, lubricants, paints, resins, grease, cosmetics, waxes, textile, leather, polyols, surfactants, printing Inks, waterproofing additives, emulsifiers, plasticizers, pigments etc.